of well-potted upright ovoid form with short cylindrical neck, the rounded body of the vase divided into five shallow lobes by narrow raised double lines, each lobe decorated with a freely incised cloud design in the center, below a slender faceted spout rising up and out from the shoulder, the base of each spout surrounded by lightly incised radiating lines within a quatrefoil petal-collar and the shoulders further decorated with paired concentric ring motifs and fine radiating lines engraved on either side of the twin ribs between the spouts, covered overall with a glossy translucent silvery-green glaze pooling to a deeper green in the carved areas to highlight the design and continuing over the recessed base, the bottom edge of the flaring foot left unglazed revealing the gray stoneware unevenly burnt reddish-brown around the marks left by the kiln supports. A Yueyao five-spouted vase of similar form, in the Hakone Art Museum, decorated with incised peony design, is illustrated in Mayuyama, Seventy Years, Vol. I, Tokyo, 1976, no. 334, p. 116. Another similar vase with carved peony decoration in the Indianapolis Museum of Art is illustrated by Mino and Robinson, Beauty and Tranquility: The Eli Lilly Collection of Chinese Art, Indianapolis, 1983, pl. 72, pp. 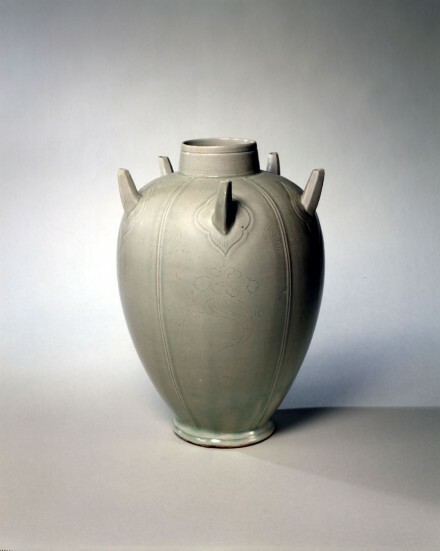 196-7, where the authors cite a similar Yueyao five-spouted vase with plain body divided into five shallow lobes in the Kikusui Kogeikan Museum, Kawanishi-cho, Japan, illustrated in color in Sekai Toji Zenshu, Vol. 12, (Ceramic Art of the World), Tokyo, 1977, pl. 172, p. 197, together with another Yueyao five-spouted vase with body divided into five shallow lobes and engraved with overlapping petals, in the Tokyo National Museum, donated by Dr. Yokogawa Tamisuke, op.cit., pl. 173, p. 197. Compare also the tall Yueyao trumpet-neck vase with lobed ovoid body decorated with freely incised rising cloud designs very similar to the decoration on the present example, now in the British Museum, illustrated by Vainker, Chinese Pottery and Porcelain From Prehistory to the Present, New York, 1991, fig. 52, p. 72.